A description of Cairns’ colonial/strategic engagements in November 2011. 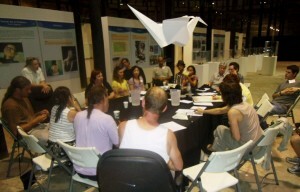 Part 2 will be Cairns social dynamics and political opportunities for LOCAL peace action in 2012. Part 3 will examine NATIONAL opportunities. Cairns – Location Location Location………..
A perspective in the time of unaware military/nuclear expansion. Right next to the Coral Sea. Cairns is a semi-modern tropical city* of 150,000, nestled between the Great Barrier Reef, and the remnant wet tropical rainforest along the great dividing range in north-eastern Australia. 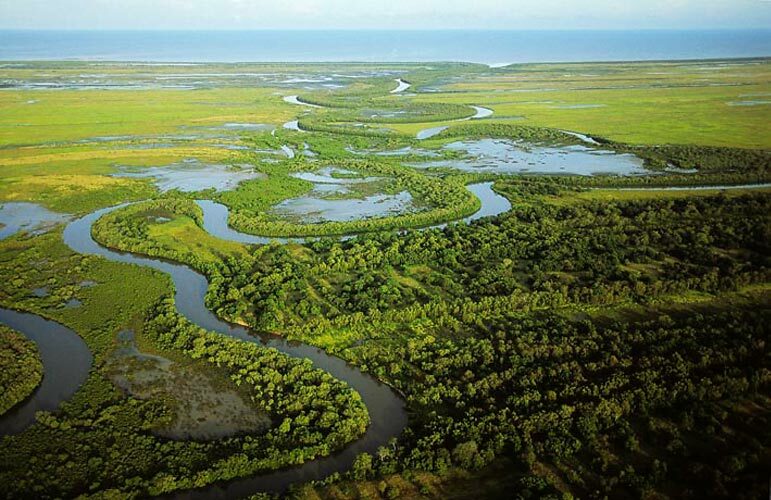 To our north is Cape York Peninsula – a land area of 121,100 sq kilometres with 19,000 (mostly Aboriginal) people. Lots of/different kinds of wilderness under pressure. Right next to the Coral Sea. Out west is the Gulf country. 130 years on from settlement, Cairns is an outpost of European colonialism in Asia. In the suppression of indigenes, support of minerals exploitation in east and west Papua, and R&R base for the forward deployed US Navy, Cairns serves as an administrative and service centre for attempted European dominance of the Pacific basin. 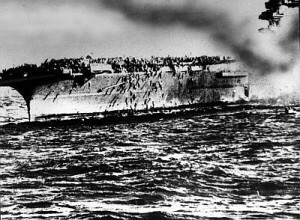 The battle of the Coral Sea in 1942 is emblematic of Australia’s contemporary relations with the US empire in the Pacific, and Cairns is the closest city to it. In St Monica’s Catholic Cathedral in Cairns a set of stained glass windows memorialise this battle. Designated as a “peace window” the images are of death in the midst of life, in our coral seas. The battle was a tactical victory for US and Australian naval forces preventing Japanese occupation of Port Moresby. At this point Australia had pivoted in its great power alliance from Britain to the USA. 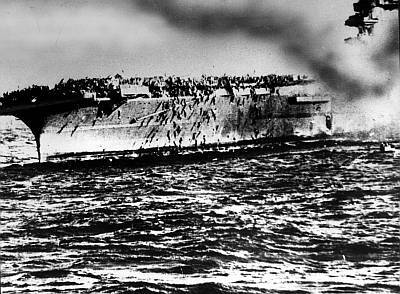 1942-23-USS Lexington sailors jump overboard as ship sinks in coral sea battle. Nearly 70 year on, we are binding ourselves ever closer to the might and power of US militarism. Australia has agreed to be a permanent US garrison, as a fall-back position from which the US can “project power” into both the Indian and Pacific Oceans (in the event of an emergency). 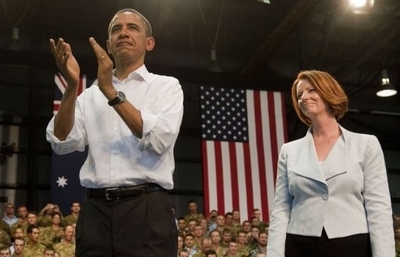 On 17 November PM Gillard and US President Obama announced the creation in Darwin, Australia, of a US Marine “rotation”. With more to come. President Obama mistakenly announced the 21st Century as the US Pacific century. Ooops. 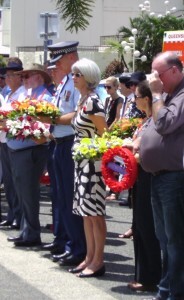 HMAS Cairns is a large and important enterprise to the people and economy of Cairns. Using a lot of services. With responsibility for patrolling the Torres Strait and Coral Sea, with intelligence, customs, and immigration at the fore-front of concern. 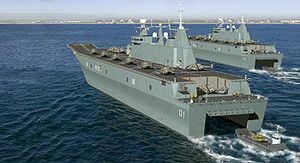 artists impression of Canberra class Helicopter Landing Docks presently being built for Australia. The Pacific war saw an end to phase 1 of European colonialism in East Asia as in every country the pucka white governors were dispensed with, and the terms of colonial exploitation became terms of trade. The threat of military intervention underpinned those terms of trade. The actual USS Essex, pictured here in Thailand, has visited Cairns and will again. For nearly 70 years phase 2 has seen the European powers use intellectual property, capital, and access to resources to enjoy wealth and comparative advantage in trade with a “free” Asia. Phase 2 of European colonialism in East Asia has now come to an end. The battle of colonial exploitation is still being played out to our immediate north. 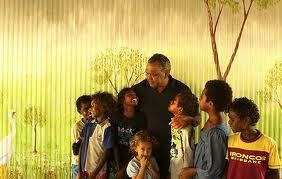 There are many, many different Aboriginal peoples in the country we call Cape York. Recent European settlement, strong indigenous leadership, some enlightened church assistance, and historical chance has provided many of them with a freehold quality land title that, in theory, ought vest in Aboriginal people the same quality of land sovereignty enjoyed by all other freehold land owners. 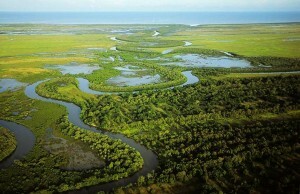 At the same time, European eyes are beginning to see the ecological and conservation values of this land. And so an urban political agency (let’s call it TWS) makes effective demands of the Queensland government which constrains and diminishes the Aboriginal freehold title so recently won. Aboriginal leadership across Cape York Peninsula are at work defending their rights and dignity. The engagement of UN bodies (such as UNESCO in any movement towards a proposed World Heritage listing) ensures Aboriginal people an avenue to power outside the colonial system. In their long and successful campaign to win back human rights, Aboriginal leadership has made powerful use of such forums. We can expect they’ll do so again. The existence in Cairns of considerable racial bigotry ensures that community and social processes are mired in conflict around land use and conservation issues. 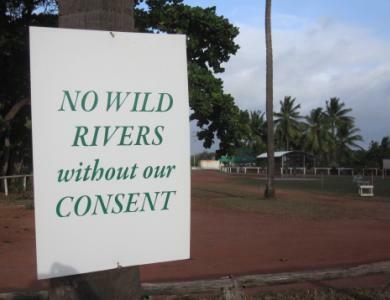 Wild Rivers, Indigenous Hunting, Juvenile Crime and Indigenous Poverty are all active and conflicted issues in Cairns. Our family is partisan in this conflict. We are committed to supporting Aboriginal sovereignty. We are committed to respecting aboriginal leadership. We interrupt attacks on Aboriginal leadership, and support Aboriginal led political demands. Wherever possible. Our vision is one of a powerful reconciled set of communities pursuing the better life project. There’s plenty of traditional and scientific knowledge about the anthropology, sociology and natural history of the region. There’s plenty of leadership in the region, along with the creativity and good will for healing wounds and moving towards justice. The people of Cairns are able to be partners in a mutual and profitable process of emancipation, if we choose. Queensland policy in the 1960s was to move Cape York aboriginal peoples north, to the Northern Peninsula Area, where they would be policed by imported Islander peoples. The colonial powers distinguish among indigenous peoples, and where possible set one against another. Also in the 60s we (US mob) changed the future of West Papua from independence to Javanese possession – controlled by the military and exploited for its mineral wealth. It was all confirmed by 1969’s “Act of Free Choice”. Or as the locals call it “act of no choice”. We give aid and training to the Indonesian military, including to the special forces behind so many of the human rights abuses in West Papua. On 19 October 2011, at Jayapura, Indonesian forces arrested and killed many West Papuans attending the 3rd West Papuan People’s Congress – which had just declared independence from Indonesia. West Papua’s independence movement is nonviolent. 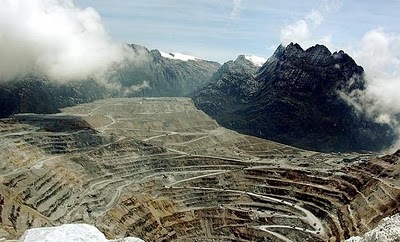 Freeport Mine, known as Grasberg mine, is the largest gold mine and third largest copper mine in the world. It's situated near Puncak Jaya, the highest mountain in Papua. Immediately to our north lies what some would call East Papua, a struggling grafted democracy in which a variant of crony capitalism and other raskolly behaviours lead to widespread poverty and crumbling infrastructure. Same as but different from West Papua. And just like in West Papua, the Australian government is happy to deal with suitably qualified kleptocrats. Our family is partisan in this (although less actively) and supports Papuan sovereignty. We support the Peoples Congress and their declaration of independence. Indonesian militarism needs to be constrained. (A thorny problem). Pacific trade is booming for Australia, the quarry of Asia. 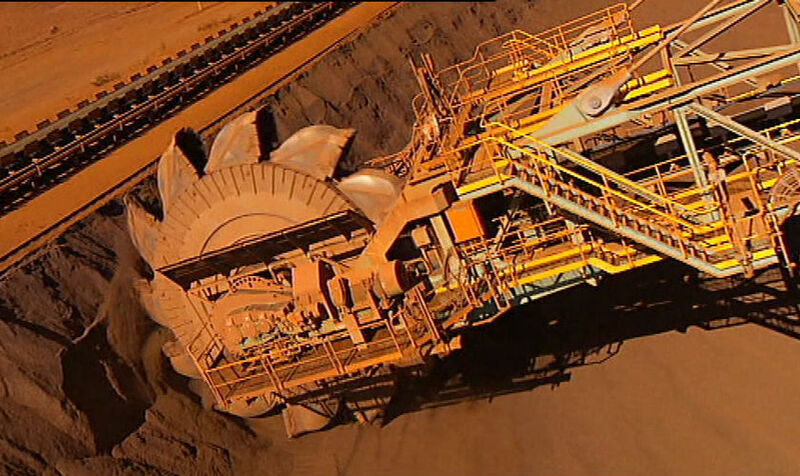 We’re selling mineral as quick as we can rip it out, and the mining companies are making so much money out of it, even the Labor Party thinks they should pay some taxes. 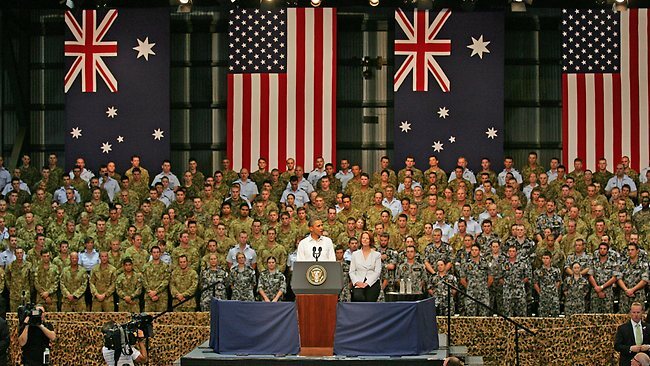 Obama’s speech to Australia’s parliament on November 17 2011 (the Pacific is subject to enduring US interest) was predicated on the assumption that the US will control (or will be a party to controlling) “the rules” of global trade, including Pacific Basin and Indian Ocean trade. It’s difficult to see this position being sustained for much longer. Maybe not for another five years. Certainly not for another decade. The US is right now under-going a severe economic contraction, that we haven’t seen the bottom of yet. Ditto Europe. The rise of China and India will continue because their supply networks and skills base allows self-reliant progress in their respective domestic projects (which are also hugely huge). We’re at sixty years after liberation/recovery for two long-standing and effective civilisations. How can we be surprised at their re-emergence as world powers? ANZUS, born 1951, is meant to give us military protection from all comers by the United States of America. In the Pacific. How realistic is that today? Tomorrow? If you were making a bet about future performance in trade, would your money be on China, or on the USA? Who do you think everyone else will get on? Over 5 years, over 10, over 20? In a democracy, people would get a chance to discuss such things before we commit to a military alliance that may exclude us from future benefits in Pacific basin citizenship and trade. In Cairns we provide R&R and re-victualling/re-fuelling services for US Navy warships and Marines. We see multiple warships every two years at least when they stop in on their way to and from Exercise Talisman Sabre near Rockhampton. We see them from other exercises and operations on an irregular basis. The frequency of warship visits to Cairns will rise slowly but surely under the new agreements. At the same time Cairns will remain a minor component of the Pacific/Global military machine. Darwin is the key pivot point in Australia between the Pacific and Indian Oceans, and will be the first Australian city to host more US personnel, materiel, and operations. 2,500 Marines will train and transit through army and air-force training areas. Equipment for both training and operations will be “pre-positioned” in northern bases ready for use. US air forces will train on Australian exercise areas and rotate through Darwin and Tindal air bases. US President Obama flies the flag and parades the troops along with Deputy Sheriff Julia KillHard. The Marines are primarily an “expeditionary force” (which means it travels to someone else’s country and invades it by force of arms). 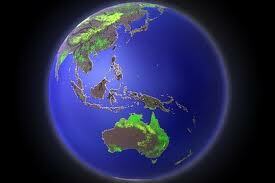 They can be deployed from Darwin (by sea and air) along a broad arc between the Persian Gulf and North Korea. Secondarily the Marines can do counter-disaster and humanitarian recovery work. Perth will be second cab off the rank, hosting a much greater presence of US Navy ships projecting force into the Indian Ocean. We might see the home-porting of US capital ships eventually. 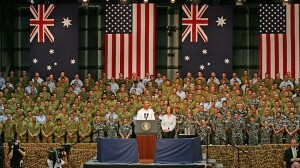 Obama’s speech indicated a withdrawal of US troops from the middle east to bases at one remove (Diego Garcia, Perth). Plus a growing nuclear alliance with India – to whom Australia will provide Uranium for its “civil” power programme. Rockhampton (Shoalwater Bay) will see an increase in US training, and Townsville (Lavarack Barracks) will see a US Army presence. Cairns will remain a liberty port for R&R. Between 1989 and 2009 the planet saw a brief “hyper-power” moment when the US so towered above the world economically and militarily that it was seen as the one true exception to civilised conduct. That moment has gone. The multi-polar reality has re-asserted itself with four distinctive blocs of interest. US/Pacific, China, India, Europe – with the US and Europe in relative decline. Our family is partisan in this and supports human emancipation. We support the aspirations of all people to live in peace, harmony and plenty. 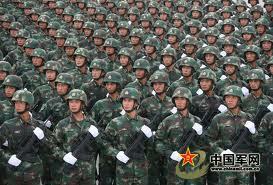 Militarism needs to be constrained (a thorny problem). Our vision is one of a powerful reconciled set of communities using the principles of mutual aid to pursue the better life project. There’s plenty of traditional and scientific knowledge about the anthropology, sociology and natural history of our planet. There’s plenty of leadership in the world, along with the creativity and good will for healing wounds and moving towards justice. 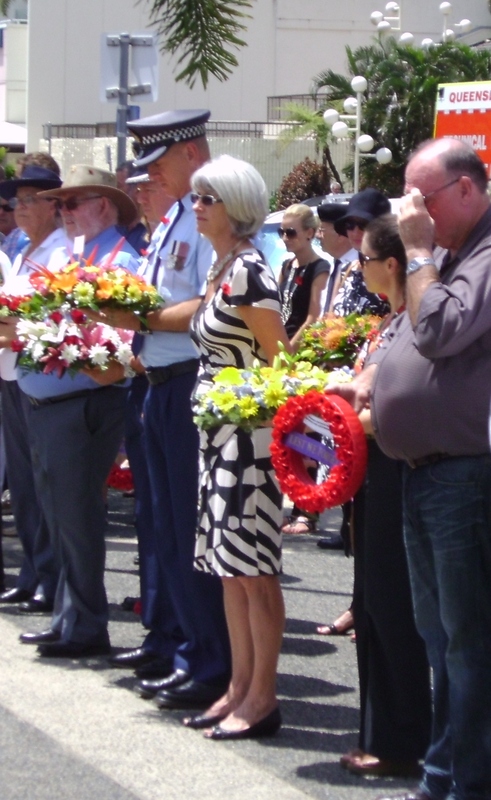 The people of Cairns are able to be partners in this mutual and profitable process of emancipation – if we choose. The next part of this story will be about who the different people of Cairns are, and some of the processes and opportunities available for working towards peace and justice.